From Stonewall to the demise of DOMA, we are the family and friends of Harvey Milk, Marco McMillian, Matthew Shepard, Ebony Whitaker and Amanda Gonzalez-Andular. We are following in the legacy of other great Movements: Women’s Suffrage, European Liberation, Farm Workers, and Civil Rights. We are leading the growing chorus in this fight. We Are Straight Allies is extremely proud and deeply honored that Gloria has joined us as a Straight Ally. In her book, Outrageous Acts and Everyday Rebellions, Gloria expresses her beliefs, with every fiber of her being, that it’s the things we all do that keep “the movement” going—for women, gays, lesbians, transgendered individuals, and everyone still fighting for equality. Gloria Steinem travels widely as a feminist activist, organizer, writer and lecturer. Her books include the bestsellers Revolution from Within: A Book of Self-Esteem, Outrageous Acts and Everyday Rebellions, Moving Beyond Words, and Marilyn: Norma Jean, on the life of Marilyn Monroe. She was an editor of The Reader’s Companion to U.S. Women’s History. Steinem co-founded New York Magazine and Ms. Magazine where continues to serve as a consulting editor. She has been published in many magazines and newspapers here and in other countries, and is also a frequent guest commentator on radio and television. She helped to found the Women’s Action Alliance, the National Women’s Political Caucus, and Choice USA. She was the founding president of the Ms. Foundation for Women and helped create Take Our Daughters to Work Day. She has served on the board of trustees of Smith College, and was a member of the Beyond Racism Initiative, a comparative study of racial patterns in the U.S., South Africa, and Brazil. She has also co-produced a documentary on child abuse for HBO, and a feature film for Lifetime. Ms. Steinem graduated Phi Beta Kappa from Smith College in 1956, and then spent two years in India on a Chester Bowles Fellowship. She wrote for Indian publications, and was influenced by Gandhian activism. Gloria has received the Penney-Missouri Journalism Award, the Front Page and Clarion awards, National Magazine awards, an Emmy Citation for excellence in television writing, the Women’s Sports Journalism Award, the Lifetime Achievement in Journalism Award from the Society of Professional Journalists, the Society of Writers Award from the United Nations, and most recently, the University of Missouri School of Journalism Award for Distinguished Service in Journalism. Other recognitions include the first Doctorate of Human Justice awarded by Simmons College, the Bill of Rights Award from the American Civil Liberties Union of Southern California, the National Gay Rights Advocates Award, the Liberty award of the Lambda Legal Defense and Education Fund, the Ceres Medal from the United Nations, and a number of honorary degrees. Parenting magazine selected her for its Lifetime Achievement Award in 1995 for her work in promoting girls’ self-esteem, and Biography magazine listed her as one of the 25 most influential women in America. In 1993, she was inducted into the National Women’s Hall of Fame in Seneca Falls, New York. She has been the subject of Lifetime and ABC biographical television documentaries, and The Education of a Woman, a biography by Carolyn Heilbrun. We Are Straight Allies congratulates Gloria on receiving this highest award. Words cannot express the deep appreciation and respect we feel towards each of you for participating in this movement. As we’ve listened to your stories and connected with your positive, powerful energy, we are reminded yet again that our freedoms are inextricably bound. Earlier this year, Chevara Orrin was asked to serve as the keynote speaker for Black History Month for MEPS (Military Entrance Processing Station). The theme was “We are Standing at the Crossroads of Freedom and Equality.” She shared her personal connection to the Civil Rights Movement – her white, Jewish civil and human rights, women’s liberation activist mother, and her father, James Bevel, a fiery orator and strategist who served as one of Dr. King’s top lieutenants, who was a driving force of the civil rights campaigns of the 1960’s, including the Birmingham Children’s Crusade. She reminded them that history often repeats itself. A century after the Emancipation Proclamation was issued, the struggle for equality manifested into the 1963 March On Washington, a rally for jobs, economic equality and freedom. Fifty years later, we are yet again standing at the crossroads of freedom and equality. When our City Council voted 10-9 to reject a bill expanding the city’s human rights ordinance to protect gays and lesbians from discrimination, we were in that standing room only crowd of about 500 people. As we watched the votes of council members appear on the digital board, we thought of Bayard Rustin, the chief organizer of the March on Washington. It was Bayard Rustin who first brought Gandhi’s nonviolent resistance protest techniques to the attention of Dr. King. It was Bayard Rustin who helped mold Dr. King into an international symbol of peace and nonviolence. It was Bayard Rustin who stood teetering precariously at the intersection of race and sexual orientation at a time, not much different than now, when discrimination and homophobia runs rampant in our community. Chevara thought of Fannie Lou Hamer, Harry Belafonte, Harriet Tubman, Goodman, Chaney and Schwerner, Emmitt Till, Jimmie Lee Jackson, Father Popieluszko and Harvey Milk. And then, about her own sons and the world that they will inherit from us. Last October, a documentary, Messenger of the Truth, was screened at the Jacksonville Film Festival. It is the true story of a Roman Catholic priest who fought for social justice in Poland in the 1980’s. As images of Father Jerzy Popieluszko’s battered, bloated body pulled from the Vistula River in Poland in 1984, it was reminiscent of Emmett Till’s mutilated corpse floating in the Tallahatchie River in Mississippi in 1955. Abolitionist Movement. Eastern European Liberation Movement. Civil Rights Movement. Women’s Suffrage Movement. Feminist Movement. Lesbian, Gay, Bisexual, Transgender Movement. Lives lost and transformed through struggle for human rights, social justice, and political and religious freedoms. Connections that are deeper than symbols. Millions of slaves emancipated. 300,000 freedom fighters marching on Washington. 100,000 Polish Catholics celebrating the life and mourning the death of Father Jerzy Popieluszko, hands raised in a fist, the index and middle fingers extended. The “V” sign for victory….for peace. The Black Power salute, arm outstretched with clenched fist, made in protest by African-American athletes, Tommie Smith and John Carlos, during their medal ceremony at the 1968 Olympic Games in Mexico City. Thousands standing in silent solidarity attending a candlelight vigil in San Francisco honoring Harvey Milk or being attacked by state and local police with billy clubs and tear gas while marching across the Edmund Pettus bridge in Selma, Alabama. Peaceful protests, violent confrontations, brilliant and charismatic leadership, strategy, all for the belief in freedom. It is our collective responsibility to begin … again … this work — NOW! The road to freedom is long and arduous, but as Tracy Chapman sings, “If not now, then when? Thank you for your time and commitment. We look forward to sharing our work with the world. ***We’ve included a link for the 2005 Academy award-winning short documentary, Mighty Times: The Children’s March. This film was co-produced by the Soutern Poverty Law Center and HBO, and tells the story of the Birmingham civil rights marches. The Children’s Crusade was initiated and organized by Chevara’s father, James Bevel. For four days in May, 1963, thousands of school students marched in peaceful nonviolent protest to desegregate the city. They were beaten, hosed, attacked by dogs and arrested. This pivotal campaign promoted President John F. Kennedy to publicly fully support racial equality and led to the passage of the Civil Rights Act of 1964. Dr. Irvin PeDro Cohen is the Executive Director of the New Town Success Zone, a community collaborative initiative largely based upon the work of Geoffrey Canada and the Harlem Children Zone. PeDro also serves on the advisory board of the Florida Council on the Social Status of Black Men and Boys, the University of North Florida’s School of Education Dean’s Advisory Council, the University of Florida School of Pediatric Medicine’s CTSI Community Advisory Board, he is a member of the Jacksonville Chapter NAACP and Kappa Alpha Psi Fraternity Incorporated Jacksonville Alumni Chapter. His blog can be seen at www.irvincohen.com. Why is PeDro a straight ally and supporter of the HRO ordinance? I am an ally and supporter of the HRO ordinance because as an African-American male I uniquely understand what the sting of discrimination feels like. Furthermore, as someone who believes in the spiritual principles associated with LOVE and BEING I find it counterproductive spiritually to simply deny anyone service based upon their sexual orientation. Finally, as a lover of people and the unique experiences they bring to my own personal growth and existence I would not want to deny myself an experience based upon some baggage brought on by discriminatory practices that involve sexual orientation. Watch his video in support of his LGBT friends and community here. Rachel Vitti is the wife of Dr. Nikolai Vitti, Superintendent of Duval County Schools, mother of four, daughter, sister, sister-in-law, niece, grand-daughter, friend, teacher, education and social justice advocate. She is a former public school teacher who served students in Winston-Salem, NC and Harlem, NY. Rachel has spent the last ten years dedicated to nurturing and educating her four children ages 4-10. Aside from focusing on their development, she has also served as an advocate for exceptional-student issues within the public school system – namely students with specific learning disabilities. She has empowered parents with information and strategies to navigate the education system and improve access to appropriate resources for their children. Rachel holds a Bachelor of Arts in Sociology from Wake Forest University and a Master of Arts in Teaching from Salem College. The sobering fact is that less than 50 years ago, without the voice of allies, I would have been arrested and jailed for displaying my human right to love a man, who shares my heart, brings me to a poignant pause. Less than 50 years ago, without the voice of allies, my four bi-racial children would have been deemed to be illegitimate and would not have been given the protections and privileges afforded to the children of lawfully wedded parents. Less than 50 years ago, allies stood to bring a voice to Mildred and Richard Loving and their three children, so they too could benefit from America’s Promise. The 1967 Supreme Court Case of Loving v. Virginia was a pivotal civil rights decision that invalidated laws prohibiting interracial marriage. That decision was a culmination of collaborative efforts of people around the nation. 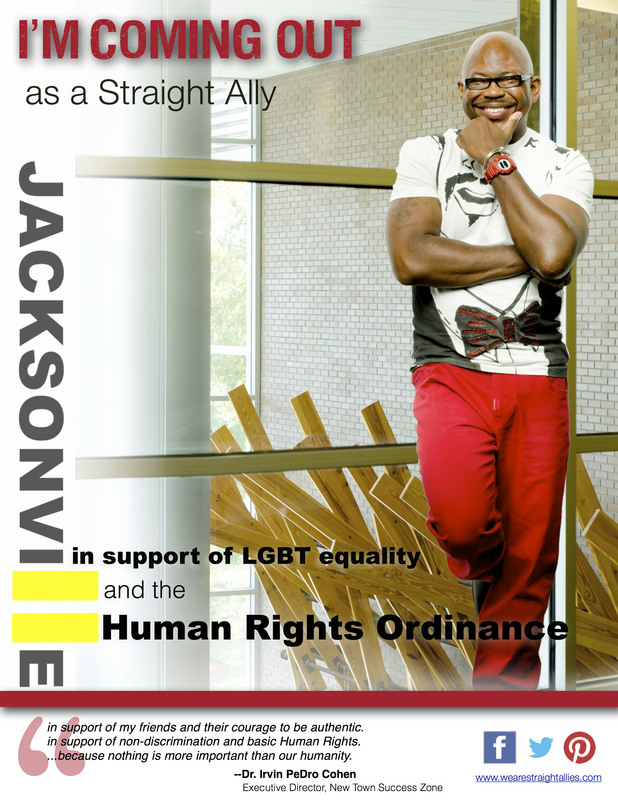 Today, on the shoulders of those who have stood tall, and those still standing, I am coming out as a Straight Ally to expand the Jacksonville Human Rights Ordinance to include our LGBT families. As a mother raising four young citizens, it is essential that I exhibit a civic duty to ensure that all people can be open, honest, and safe in their home, school, work, and community, without fear. It is important to help victims of intolerance and hate, fight for their basic human rights. Although I am a new member of this city, I expect Jacksonville to live-up to the motto of “The Bold New City of the South” and move towards full equality for everyone. To me, this matter is quite simple; afford the same justices and dignity to your neighbors for the betterment of our community. My responsibility to my community and to my family includes supporting those families that may not look like mine, worship the same as mine, or speak the same language as mine.